Did you know that if you eat at least three bananas a day, you can significantly reduce your risk of having a stroke or heart attack? According to British and Italian researchers, consuming one banana at breakfast, one at lunch, and one in the evening will provide enough potassium to reduce the risk of a blood clot in the brain by 21%. The 2011 report, published in the Journal of the American College of Cardiology, suggests that stroke cases can be prevented or even reduced by the potassium levels found in certain foods, including bananas, fish, spinach, and lentils. Researchers discovered that a daily potassium intake of around 1,600 mg can lower stroke risk. An average-sized banana contains approximately 500 mg of potassium—three a day can lower blood pressure and help with proper brain and nerve function. Bananas are not only packed full of potassium, but they are also good sources of vitamin B6, vitamin C, manganese, biotin, and dietary fiber, which can help to properly regulate the digestive system. The average banana contains approximately 108 calories; they contain little cholesterol, fat, or sodium. (all of which can contribute to weight gain. )Since bananas are low in glycemic carbohydrates, they make a delicious snack for athletes who are looking for an extra boost of energy. Some research even shows that consuming three bananas can give you enough energy to complete an intense 90-minute workout. 1. Reduces depression: Bananas contain tryptophan, a type of protein that the body converts into serotonin—serotonin is a compound that relaxes the body and helps to improve mood. 2. Regulates blood pressure: The potassium found in bananas can help regulate heart function and the body’s fluid balance; this can help reduce the risk of blood pressure and stroke. 3. 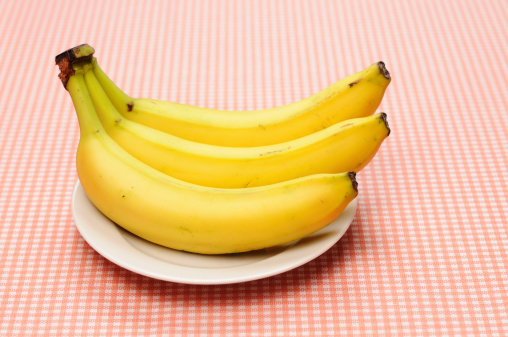 Treats constipation: An average-sized banana contains just over three grams of fiber; if you are constipated, then try incorporating bananas into your diet to restore your bowels—a great, natural alternative to laxatives. 4. Cures hangovers: Perhaps not an issue everyone has to deal with—but banana smoothies sweetened with honey can help treat hangovers. Bananas will help to soothe the stomach and the honey will restore dwindling blood sugar levels. 5. Boosts bone mass: Research shows that the potassium found in bananas can help prevent bones from decaying at a rapid rate. 6. Fights stress: Potassium helps regulate the heartbeat. When we feel stressed, our metabolic rates rise and potassium levels drop—eating potassium-rich foods such as bananas can help rebalance the heartbeat. 7. Smoking: Bananas contain vitamins B12 and B6, along with potassium and magnesium, which can help the body recuperate from the effects of nicotine withdrawal. 8. PMS: Bananas contain vitamin B6, which will help normalize the body’s glucose levels, which can positively affect your mood. Longo, N., “20 Reasons To Eat 3 Bananas Per Day – And No They Won’t Make You Fat,” PreventDisease.com, September 26, 2012; http://preventdisease.com/news/12/092612_20-Reasons-To-Eat-3-Bananas-Per-Day-And-No-They-Wont-Make-You-Fat.shtml. “Eating 3 Bananas a Day Will Cut the Risk of Stroke,” Health Doctrine web site; http://healthdoctrine.com/eating-3-bananas-a-day-will-cut-the-risk-of-stroke/, last accessed June 1, 2015. “Bananas,” The World’s Healthiest Foods web site, http://www.whfoods.com/genpage.php?tname=foodspice&dbid=7, last accessed June 1, 2015.